Joe has a great man cave for EVERYONE! 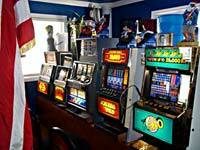 Slot Machines, Arcade Games, Pinball machines, Foosball tables, Air Hockey Games, Karoke machines, Skeeball, Shuffleboard, Billiards, Darts and more. Joe's cave has it all! Want your man cave featured on ZieglerWorld? Bob calls his man cave a labor of love. He enjoys putting his personal touch into projects. 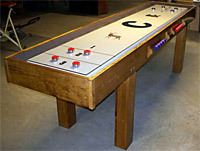 He's restored a 1966 Gandy pool table and will be starting on a 1964 Brunswick very soon. His man cave is about 2,000 s.f. and was a concrete floor and bare sheetrock a year ago. The theme for his man cave is Steampunk. 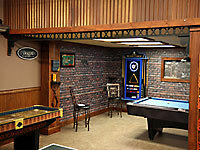 View more photos of Bob's man cave. View more photos of Dustin's man cave. 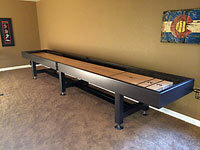 View more photos of Ryan Pieper's man cave. 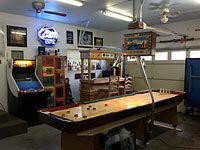 View more photos of Jesse Prohn's man cave.